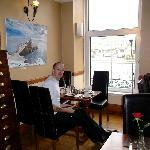 I had stayed in the Portree Hotel on my last visit to the Isle of Skye and had enjoyed my stay. My room had been up at the top of the hotel looking out over the sea and the views are just beautiful. However, that was before the building of the Skye Bridge, and more years ago than I am prepared to admit! Nevertheless, on a recent visit back to the island, to allow me to go over the bridge to Skye, I was delighted that my friend, Ann, and I had time to visit this hotel too. I had such fond memories of it. 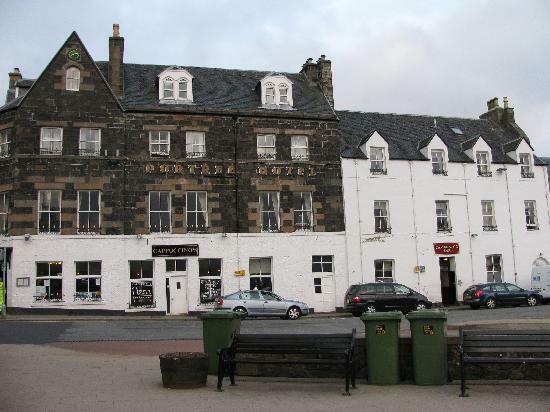 The Portree Hotel looked much as I remembered it. That was a surprise, bearing in mind the passage of time. Inside it was equally dark as I recalled and the carpets leading to the upper floors were worn and tired. The public lavatories on the first floor were dated and tired but perfectly clean. It made me rather sad. Maybe you should never go back. It is like a lot of renovated, old properties, well located, but a bit rundown. The en suite rooms are quite adequate for the price. Parking is available outside the door in the main square, although we did not arrive by car. Internet access is available but only in the ground floor lobby and not in the rooms. This is not unusual on the Isle of Skye, but it is inconvenient. The food is served in a warm, bright restaurant with an open fire. It is freshly made and, although the vegetarian choices are limited, the food is good and the quantities ample. The staff are welcoming and accommodating. The hotel is in a superb position in the middle of the capital town of the island. However, I will hold on to my original fond memories and will not return to this rather dated hotel. Enjoyed reading your comments. I have never stayed there but my impressions are similar to yours. I enjoyed this article. Thank you for sharing it with me.